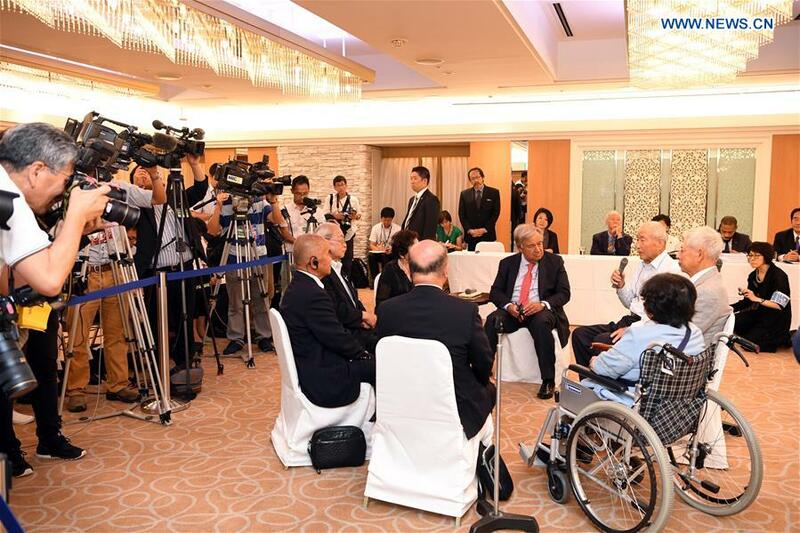 United Nations Secretary-General Antonio Guterres called for a world free of nuclear weapons when meeting with representatives of atomic bombing victims here on Wednesday. "When we see a lack of commitment to (nuclear) disarmament, to amplify the voice of the surviving victims becomes more and more important," Guterres told representatives of the atomic bombing victims. He said that the UN would make joint efforts with these victims of atomic bombing to achieve a world free of nuclear weapons. The UN chief arrived in Japan on Tuesday for his second visit since he took the current portfolio. He had a meeting with Japanese Prime Minister Shinzo Abe in Tokyo Wednesday morning. To accelerate Japan's surrender in WWII, the U.S. forces dropped two atomic bombs on Hiroshima and Nagasaki on Aug. 6 and Aug. 9, 1945. Japan surrendered to the Allied Forces on Aug. 15, 1945, bringing an end to the war.